Boylegames: Free €/£10 new player bonus. No deposit required! 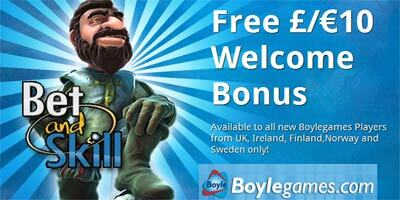 Free £/€ 10 Welcome Bonus available to all new Boylegames Players from UK, Ireland, Finland, Norway and Sweden only! What you waiting for? If you are based in one of the above mentioned countries, don't waste your time.. get your €/£10 no deposit bonus offered by Boylegames! How do I get my Free £/€10 ? Register a new account and enter Bonus Code: FREE10 in the Bonus Information tab on the left hand side of the homepage. The Free £/€ 10 will appear in your game balance when you open one of the eligible games. Open a new account with Boylegames now! Wild Rockets, Beach, Evolution, Lucky Angler, Disco Spins, Alien Robots,Boom Brothers, Crime Scene, Dead or Alive, Demolition Squad, Devil's Delight, Dragon Island, Egyptian Heroes, Excalibur, Flowers, Frankenstein, Fruit Case, Fruit Shop, Ghost Pirates, Gonzo's Quest, Jack and the Beanstalk, Jack Hammer, Jack Hammer 2 : Fishy Business, Kings of Chicago, Mythic Maiden, Piggy Riches, Robin Hood: Shifting Riches, Scarface, Simsalabim, Spellcast, Starburst, Subtopia, The Funky Seventies, The Groovy Sixties, The Super Eighties, Thunderfist, Victorious, Zombies. Can I withdraw my winnings straight away? The bonus must be wagered through 35 times. Maximum cash out of £/€100 applies to this offer. Minimum deposit of £/€ 20 is required before withdrawal permitted. Free £/€10 bonus Terms and ConditionsThe New Player Bonus funds can only be used on following slots Only: Wild Rockets, Beach, Evolution, Lucky Angler, Disco Spins, Alien Robots,Boom Brothers, Crime Scene, Dead or Alive, Demolition Squad, Devil's Delight, Dragon Island, Egyptian Heroes, Excalibur, Flowers, Frankenstein, Fruit Case, Fruit Shop, Ghost Pirates, Gonzo's Quest, Jack and the Beanstalk, Jack Hammer, Jack Hammer 2 : Fishy Business, Kings of Chicago, Mythic Maiden, Piggy Riches, Robin Hood: Shifting Riches, Scarface, Simsalabim, Spellcast, Starburst, Subtopia, The Funky Seventies, The Groovy Sixties, The Super Eighties, Thunderfist, Victorious, Zombies. Any won money during free rounds is considered Bonus money and must be wagered 35 times before it turns into real cash. *Minimum deposit is £/€ 20 before withdrawal is permitted. The maximum bet allowed when using a bonus is £/€ 5. Cash funds withdrawal after wagering requirements are met is capped at £/€ 100. Any player who wishes to make a withdrawal from their account will need to verify said account before any withdrawal is processed. This may include a request for photo ID, proof of address and/or a copy of the front and back of a debit/credit card. The wagering requirement must have been cleared within 7 days of issue to be valid, unless otherwise stated. Boylegames reserves the right to deny or withdraw the offering at any time. No written correspondence will be initiated and Boylegames decisions are final. All winnings as a result of betting with bonus money or free rounds is considered bonus money and cannot be withdrawn until the original wagering requirement has been met. Please observe that it is not allowed to use the bonus money to play on any Table Games, Poker Games, Mega Joker, Jackpot 6000 or Video Poker games. Bonuses may not be used on jackpot games. Only one use of this promotion is allowed per person, account, address, computer and IP address. Boylesports reserve the right to close any account that is deemed a duplicate account, and to not pay out any bonus to this account. Please note that only following countries are eligible for the New Player Free £/€ 10 Bonus are: Ireland, UK, Finland, Norway and Sweden. Boylegames reserve the right to change wholly or in part the terms and conditions or suspend the promotion at any time. MoPlay Review - Is MoPlay Safe Or A Scam? 888Casino No Deposit Bonus: £88 FREE chips! "Boylegames: Free €/£10 new player bonus. No deposit required!"